WEST CHESTER, Pa. — It was déjà vu for the Stony Brook hockey team Sunday afternoon. The Seawolves were unable to overcome the Liberty Flames in the Eastern States Collegiate Hockey League championship game for the second straight year, falling 2-1 in regulation. Stony Brook fell behind Liberty midway through the first period, when Liberty freshman forward Ryan Cox beat sophomore goaltender Brandon Rathwell to open the scoring. The Flames held that lead until late in the second period, when senior forward Ori Benyamini deposited his own rebound to tie the game. Benyamini’s final goal in the ESCHL sent the teams to the locker room tied 1-1 after two periods. This score would remain until freshman forward Cole Gammer went short-side on Rathwell at the midway point of the third period. Stony Brook pushed to tie the game, but never found an equalizer. Rathwell posted a .920 save percentage in the loss, turning aside 23 of 25 Liberty shots. He has now played in five consecutive games, dating back to Feb. 10. Garofalo says that Rathwell will likely start game one of the American Collegiate Hockey Association playoffs in two weeks. One of the biggest reasons Stony Brook was unsuccessful in the championship was a lack of power play production. The power play units created numerous opportunities, but never buried a puck on three man-advantages. Their inability to cash in at key moments has been an issue for the Seawolves all season. Stony Brook couldn’t score once again with a man-advantage late in the game, when it pulled Rathwell for an extra attacker. They fought until the very end but, for the second straight season, it was not enough. 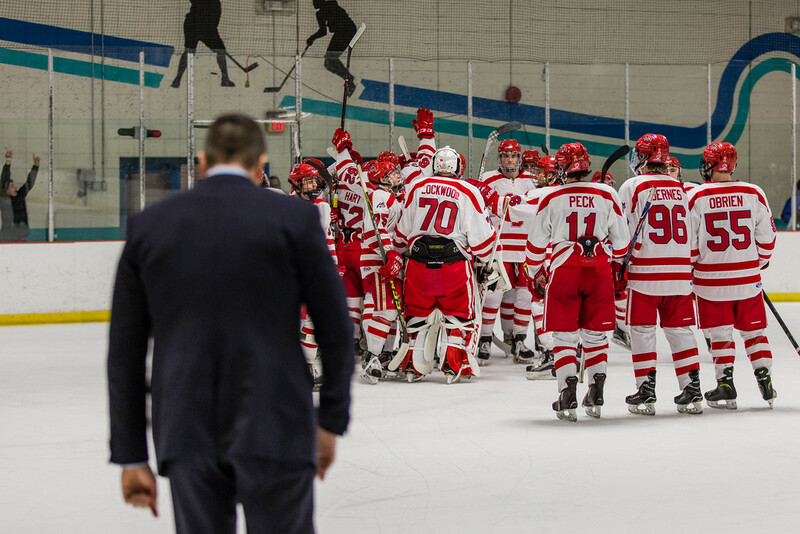 Stony Brook was able to claim a victory over NYU Saturday night and secure an ESCHL championship game berth for the seventh consecutive season against Liberty. Freshman defenseman Brendan Pepe opened the scoring for Stony Brook with under three minutes to go in the first period, shooting top-shelf on NYU sophomore goaltender Adam Salisbury for a power play goal. Freshman forward Charles Peck tacked on another goal in the first minute of the second period, extending the lead to 2-0. NYU received a fortunate bounce midway through the second when Stony Brook junior defenseman Frank Coscia deflected a puck into his own net, but junior forward Matthew Crockett regained the two-goal lead when he deposited the eventual game-winner eight minutes later. The last stop in Stony Brook’s 2017-18 campaign will be Columbus, Ohio for the ACHA national tournament. The Seawolves will face the University of Pittsburgh Panthers in the first round, which will be played on Thursday, March 8 at 4:30 p.m.